The last day of the 2010 Sierra Challenge had 18 of us at Whitney Portal, a trailhead we had not used in several years because of the restrictions on dayhikers. I had been unsuccessful in obtaining permits by lottery for the last three years and had all but given up. Fortunately Phil had taken the day off on Saturday and had managed to get 15 permits in two morning sessions by going down to the Permit Office just south of Lone Pine. Our route to Mt. Morgenson only went through a small section of the Whitney Zone, an area unlikely to be populated with rangers, but it was good to do things legal in case an issue should arise. We never saw a ranger all day as it turned out. Mt. Morgenson lies west of the Sierra Crest, just west of Mt. Russell. The peak is unofficially named for backcountry ranger Randy Morgenson who died in a remote part of SEKI NP while on patrol. His remains were found in 2001, more than five years after an intense effort following his disappearance that had found no trace of him after weeks of searching. At just under 14,000ft, Mt. Morgenson is one of the highest summits in the range without an official name, and it seems a fitting tribute. We headed up the Whitney Trail in a long line, crossing Carillon Creek and then starting up the North Fork Trail that is now an official route with signs, closed sections, and ducks galore. We scrambled up the Ebersbacher Ledges and made it to Lower Boy Scout Lake around 7:15a. By now our group had spread out and I was with the lead party of about seven as we started up the grassy slopes above the lake. I very much enjoy this route up to Cleaver Col, leading to a large amphitheater between Carillon and Gamblers Special, with Cleaver Peak rising impressively at the head of the canyon. We took a break here to restock on water, then started up the class 2-3 rock and scree slopes towards the col. This last part is somewhat tedious due to the shifting nature of the sand covering much of the area, but I found it could be mitigated some by choosing the tougher class 3 rock to the left side of the main channel that most were ascending. It was just before 9a when we reached the top of the col under sunny, deep blue skies, and an even deeper blue Tulainyo Lake lying on the west side of the col - a feast for the eyes. We took a short break here to let the group of seven reassemble. The pace was not as brisk as it had been earlier in the week and I for one was enjoying the more casual outing. Scrambling down from the col over large boulders, we skirted around the south side of Tulainyo Lake, careful over a few inclined snowbanks that promised a bumpy ride and a cold swim for anyone not paying attention. Around on the west side of the lake we hiked over a small rise into the larger basin between Mts. Russell and Morgenson. We were still together for the easy traverse across the basin, but once we arrived at the base of the peak and started up the steeper slopes, we all dispersed to our various paces. Moregenson's NE Face is little more than a steep class 2 climb over granite rock that varies from sandy talus to broken blocks to knobby friction. As usual, Sean was the first to the summit with a pace going up the NE Face that was only slightly slower than the earlier pace on the traverse, almost like we'd been keeping him in idle most of the morning and he'd finally gotten to the open road where he could give it some gas. I was second or third, but in a relatively short time we had all seven at the top. A register found at the summit was fairly new, going back only a few years. One of the familiar faces from the Mt. Whitney online forum, Richard Piotrowski seems to have made it his special favorite, climbing it multiple time and placing the register. The view is not significantly different from that of Mt. Russell, with the exception of the western view to Mts. Young and Hale, and the Kaweahs in the distant background. There is a fine view of Mts. Tyndall, Barnard, and Williamson to the north with the Wallace Lakes area in the foreground. The southern view is dominated by the broad North Face of Mt. Whitney. To the east of course was Mt. Russell and the more immediate concern of the ridgeline traversing between it and Morgenson. Expected to be the spicy highlight of the day, the traverse between the two summits has been described as class 5 along the ridge, class 3 if you drop lower on the north side to avoid difficulties. I knew that Tom Becht had done this traverse previously without a rope, but also that Matthew had backed down while with him. It couldn't be easy class 3, that was for sure, and probably a lot harder. After we (or I should say, I) had sufficient rest, I began inquiring if others were interested in joining me for the traverse to Russell. Sean and Rick agreed much as expected, Dirk was game as well once his beer was finished. The others less so, and declined. The first section to a saddle is easy class 2 over broken rock and talus, but it doesn't take long before things become more challenging. We spotted Laura and Paul below during this initial segment, waving and calling to them before resuming our efforts. They were not long in reaching the summit of Morgenson, stopping to take a well-deserved rest. Several others were to reach Morgenson after them as well. Sean led us across the first half of the traverse, Rick following behind me, Dirk somewhere further back, a bit frustrated because we had started off without warning and he had some catching up to do. There were a number of long stretches of angled slabs with great exposure made reasonable by excellent hand positions either over lips or in convenient cracks. We followed this over to the first of two snow fields on the face, needing to traverse above these in order to not have to drop all the way off the ridge. Sean decided the traversing was a bit weak and started heading up the steeper slabs leading back to the ridgeline. Too rich for our blood, Rick and I stuck to the traversing line, even as it deteriorated into a series of shorter ledges covered with loose rock and sand, the face looking decidedly less friendly. Much of what we were scrambling across spends 8 months of the year under snow and consequently looked more like a morraine as far as the rock quality goes. Crappy stuff. Some blocks would fall with an easy tug, then you'd have to stand up on a nearby one and get ready to jump aside if should let go as well. We kept far enough apart to ensure we were never directly below each other which could only serve to increase the dangers. By taking our time and moving quite slowly in places, we managed to cobble together the connecting pieces for the long traverse, spending more than an hour on the difficult middle section. When we arrived at a second saddle below Mt. Russell, Rick and I were rather relieved. Meanwhile, Dirk had followed up the ridge more or less in the same fashion as Sean. It was obvious that both were less intimidated by this ridgeline than Rick and I. Looking back, we spotted first Sean and then Dirk high on the ridgeline, appearing to have scrambled their way into a fix. But with Sean in front, one after the other they worked their way down some class 4-5 problems, solving one difficulty, then another. It was nerve-wracking to watch them from a distance, even knowing that our perspective made it look more difficult than it probably was. Once regrouped, we continued our way up Mt. Russell. Though not trivial, the class 3 we found had no route-finding issues and was a more enjoyable (though perhaps less memorable) than the traversing we'd just finished. It was 12:45p when the four of us reached Russell's higher west summit. We perused and signed the register as usual, but did not spend much time at the summit before starting down the East Ridge. By comparison to the previous exercise, the East Ridge seemed a far more pleasant and social scramble. We chatted about all sorts of things as the four of us made our way down, often by varying routes, in good time. We spotted a couple of climbers at the saddle with Mt. Carillon and recognized the one dressed in orange almost immediately as Laura. We had a small reunion of sorts at the saddle where they had waited for us. Laura was feeling emotional, having been the first women to complete all ten day's worth of Challenge peaks, and was giving hugs all around, teary-eyed. Swept up in the emotions of the moment it was natural for me to respond, "Who's going to Carillon?" Rick and Dirk were a "no", Sean was game, and Laura turned to give Mt. Carillon the finger in way of answer. I took that as a "no". Trying unsuccessfully to keep up with Sean on the easy class 2 scramble, it took but ten minutes to reach the summit. My original plan was to scramble down the Northeast Ridge of Carillon to Cleaver Col and return that way, but it looked like I was the only one interested in that. And from the looks of it, it was going to take some time to get down it. The more sociable option was to join the others for the normal descent route back to Lower Boy Scout Lake, and in the end that was what I decided on. We spent only a minute to sign in the register and take a few pictures before bolting down the South Slopes in our effort to catch up to the others that had already started across the sandy plateau southeast of the saddle. 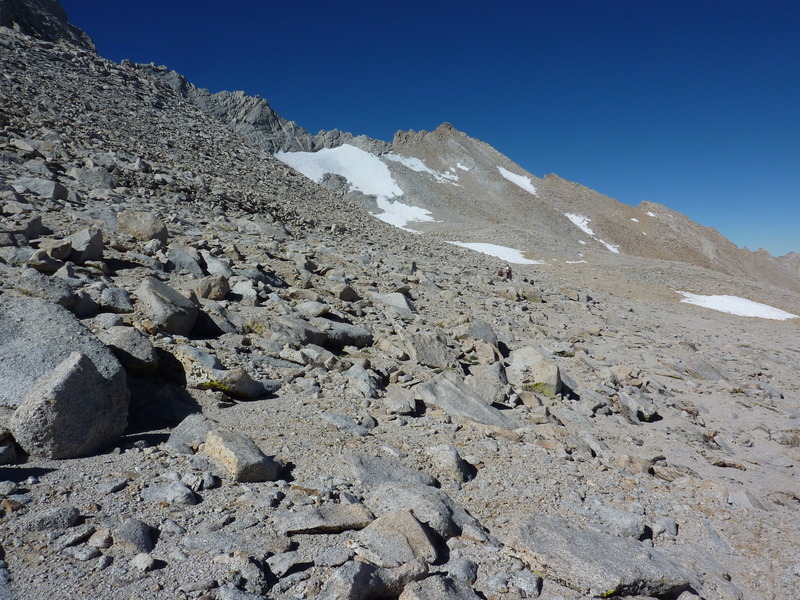 With a bit of running, we caught up to them at the edge of the plateau and the start of the 2,000-foot sand and talus descent to the North Fork of Lone Pine Creek. Laura was the first to begin the bombing run down slope, screaming as she jumped off a small ledge, the rest of us quickly falling in behind in wild abandonment. The wide open nature of the slope made for multiple possibilities for passing, and before long Laura was behind us, the testosterone and adrenaline getting the best of us in the smell of competition. It took only 17 minutes to descend the distance down to the creek where we stopped to empty handfuls of sand and pebbles out of our shoes. Rick suggested an alternative descent from this point to LBSL, the "Cliff Route" as he termed it. As something new and different, I was game as was Sean, Laura deciding to take the standard route along the creek and give herself sometime alone. Rick's was an interesting choice, one I enjoyed very much. Initially a descending traverse through open forest and sandy slopes, the route eventually emerged at the top of a cliff. By veering right (towards the north) we made use of friction slabs to descend the upper half of the cliff to a steep gully on the edge of the cliff that was used to descend the remaining distance. One emerges at the bottom of the cliff in a flat area just west of the lake. It was great fun descending back to the TH with Sean and Rick, a combination of jogging, joking, and quick route-finding decisions. Back down the Ebersbacher Ledges we went, meeting up with Eileen and a friend, two other Challenge participants, for a quick chat, then continuing our hurried pace. Rick led us down the alternate route below the ledges that stays on the north side of the creek, ducking down through overgrown alder, with only a few missed turns that he soon corrected. We reached the junction with the Whitney Trail shortly after 3p and were back to the trailhead ten minutes later. Back at the Whitney Portal Store we met up with Bob J and Phil and together we had a few beers along with our burgers. Laura came strolling in about 45 minutes later. It never ceases to amaze me how she seems to know just about everyone on the East Side and true to form she knows the store owner and all the employees as well. She even has her own special " Mooseburger" on the menu (a huge, gluttonous feast with almost a pound of ground beef in several patties, along with gobs of bacon and cheese). She also has special parking privileges at the back of the store which was very convenient for retrieving the beers from her cooler that we had with our lunch. Nice! An hour later we moved our small party to a larger one down in Lone Pine at the Pizza Factory where others had gathered. We chatted over the day's and week's events, recounting favorite moments, savoring the ten fine days of Sierra weather we were blessed with. The only close race in the Challenge was for the Yellow jersey. I had started the day with a lead of 1.5hrs over Bob Jones and might have lost it on the traverse to Mt. Russell if we hadn't made up so much time returning to the TH afterwards. Bob J and Phil had arrived back only half an hour ahead of us, leaving me with an hour's cushion. Bob Jones took the Green jersey (50yrs+) handily, as did Adam the White (<25yrs) and Sean the Polka Dot (most peaks) with 30 summits for the ten days, an all-time record. So much fun was had that I've already been working on an 11th Challenge for 2011. Thanks so much to all who participated to make it a memorable time! Kudos to Inyo SAR for a successful heli rescue of 4 climbers on Mt. Russell April 7. There is some footage on line of this amazing effort - not the usual April back country conditions.